"I've always wanted to play a mother. Not a particularly heroic mother, or a mother under siege, but a mother who takes her role seriously. I have wanted to celebrate the women of that generation who were mothers first and made it an important thing." 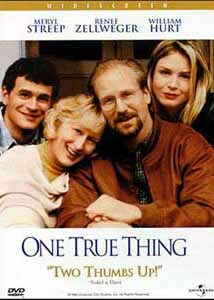 I put off watching One True Thing until late at night, figuring it was a) a chick flick, and b) that my overworked fiance would fall asleep about ten minutes into the movie and I'd be able to put on something with a bit more umph, such as One Tough Cop. Well, a couple of funny things happened on the way to the forum...a) bless her heart, she stayed the course, and b) man, could I have been more wrong about a movie? As one of my college professors said to me when I wrote a particularly silly assessment of a poem: I think not. One True Thing works on so many different levels. This is simply a superbly acted, well-written, well-crafted film. First of all, Renee Zellweger is excellent in a role which is much more, as she says, "intensely dynamic" than her role in Jerry Maguire. Second of all (and need I say much more) this film showcases two of the greatest Academy Award-winning® talents of our generation: Meryl Streep (Sophie's Choice, Kramer vs. Kramer) and William Hurt (Kiss of the Spiderwoman). Apparently, these two have known each other since performing on the stage together twenty years ago, and have been dying (no pun intended) to collaborate. Together they captivated and held my interest until the very end of this heartfelt feature. No, this film does not contain any shoot-'em-ups or car chases; it just reaches out and grabs you by the heart and mind with an exceptional script and fleshed out characters that seem real and worthy of compassion. Zellweger's character is a daughter who is forced to face a lifetime of perceptions about her parents, etched into memory throughout childhood and shaken to the core when she must move back home because her mother has been diagnosed with cancer. This film questions the roles of mothers and fathers in a modern versus old world way of thinking, particularly with what measurement of importance we label these roles. "This is a story about strength and courage," says Hurt, "but the kind of courage that comes in relationships. In understanding and changing and forgiving the people you love." Image Transfer Review: This a solid 1.85:1 anamorphic (16:9 enhanced) transfer by Universal. With the exception of a few interior scenes where the faces take on an orangish hue, the colors are deep and rich throughout. There are scenes that take place outside in the snow are sharp with detail, and do not show any aliasing distortion at all. The interior of the Gulden house is a soft palette of pastels, and here too the color rendering appears natural and appealing. The bad side of such a fine transfer, unfortunately for Miss Zellweger, is that you can see every imperfection, every pore on her face. Now that's a great transfer! Audio Transfer Review: No explosions and no booms are packed into the One True Thing DVD, but it has a nice Dolby Digital 5.0 track nonetheless. The dialogue is understandable throughout, which seems to be a minor miracle in and of itself in my house. Extras Review: There aren't many extras other than the usual cast and crew bios, web links, production notes, and a short featurette containing interview snippets with the cast, which was interesting enough that I wished that both it was longer and that there had been a director's commentary included on this disc. Meryl Streep had been bothering me for several years now, but she has brought me back to the believing fold with her excellent portrayal in One True Thing. I enjoyed Gwyneth Paltrow in Shakespeare in Love, but Meryl, my friends, was robbed. William Hurt and screenwriter Karen Croner, too, were taken for a wild ride down a deserted road during the Oscars® for not having been at least nominated. Perhaps you'll still come crying to me that this is still a "chick flick," but I really, truly believe you'll like this film despite yourself! This film honestly rates up there with the finest of 1998.